Notes from Space: One of a kind DBT Concert Package! One of a kind DBT Concert Package! One of a kind Drive-By Truckers concert package! 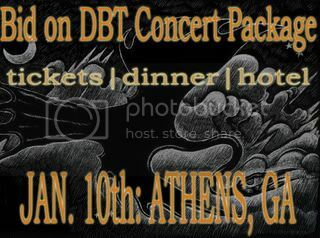 * 2 tickets to DBT's concert (Jan.10th) at the 40 Watt Club in downtown Athens. * Dinner for two at The National - located near the 40 Watt. * A room at the (very) nearby Holiday Inn for that night.Plus, DBT extras!Best of all, 100% of the proceeds benefit Athens, Ga nonprofit Nuçi's Space. Nuçi's Space is dedicated to ending suicide by providing low-cost counseling to local musicians and artists. **NOTE: Due to the unusual nature of this auction, there will be no delivery of any tickets. We will coordinate with the winners once the auction has ended and a winner has been determined.